This village WAS on the map, unlike the Islamic community I explored in the previous day. 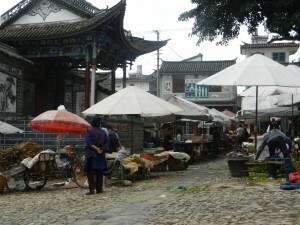 This one held an outdoor market every 3 days. I loved exploring it–only locals were there. But I couldn’t resist going off the map again. 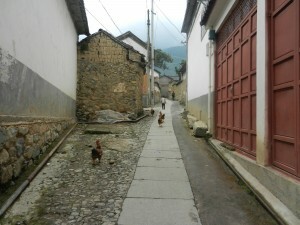 I found yet more Yunnan magic. I walked through narrow streets that twisted uphill between old ramshackle homes. I then found this painting. It was so big that it almost blocked the road–it was made to be noticed. Lots of people around Erhai Lake paint landscapes on their homes’ outer walls. But this one was done so well. 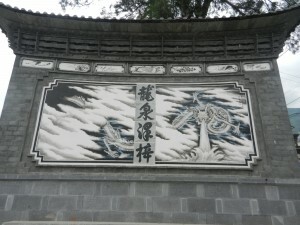 The soft clouds and powerful dragons balanced each other like Yin/Yang patterns in Daoist cosmology. So did the dark and bright colors. Everything flowed together in a whole that blended softness and strength. The universe is in harmony. These balances were developed in traditional Chinese painting. Chinese landscapes were perfected back in the Song Dynasty. So why did I find them in this humble village? 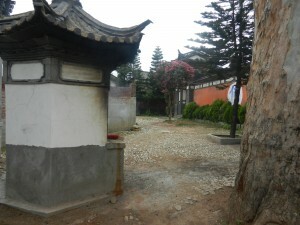 I walked around the wall and found this peaceful little yard. It was quieter and prettier than the cramped and dingy streets. I was approaching the gate of a very old Chinese institution: the city gods’ temple. 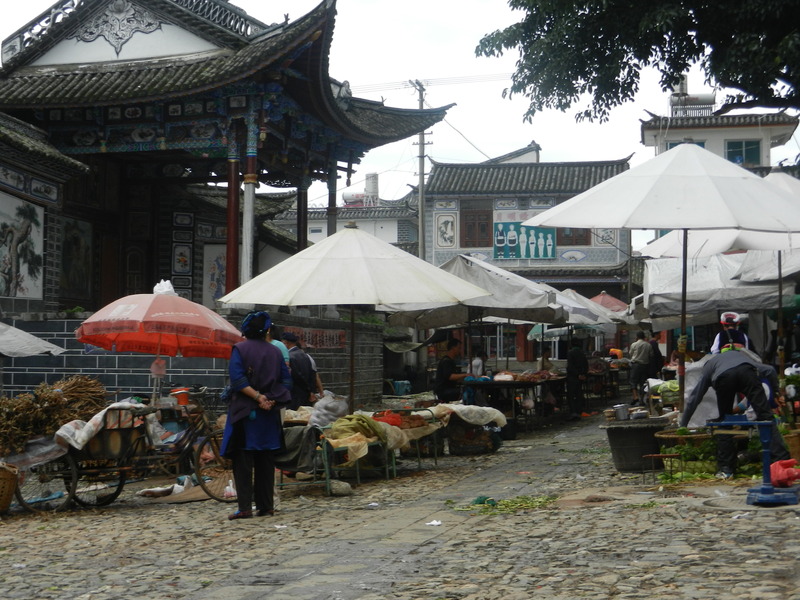 I blissed out on the other side because I became as immersed in traditional China as I’ve ever been. 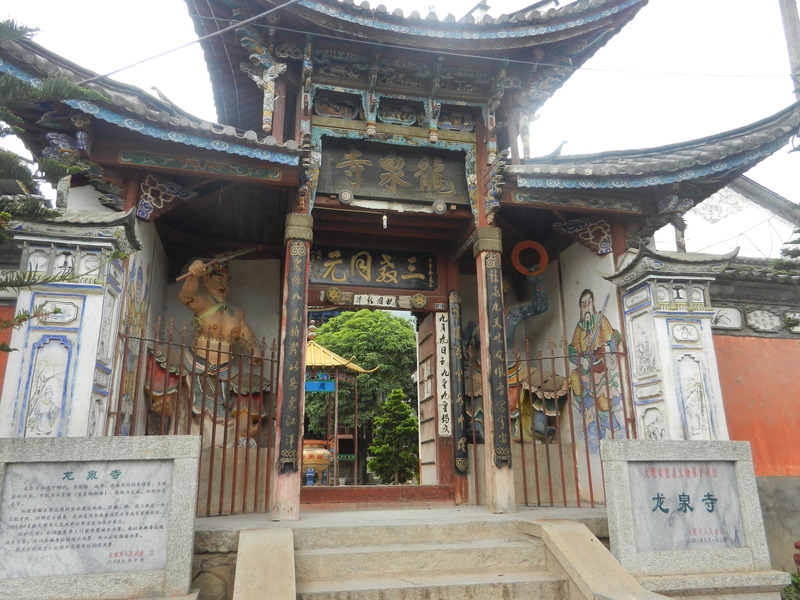 We’ll enter it in the next post, A Traditional Chinese Temple, Part Two.